Our lobby has always been a beautiful space. When it was designed after the school burned down in the mid-80’s, a dedicated team of parents, teachers and students decorated the lobby with the beautiful embroidered quilting of the Chinook Winds Adventist Academy (CWAA) crest, a picture of Jesus, a scripture: “And all thy children shall be taught of the Lord; and great shall be the peace of thy children.” Isaiah 54:13 (KJV) and board which kept track of student mission projects. It was a well-thought-out plan. Yet, as the years progressed, we dreamed of updating our lobby so that it would be an inspiring and relevant space for students, staff and visitors. But there was no money for a lobby redesign! In July 2015, my husband and I met Nathan Greene at the General Conference meetings in San Antonio, Texas. As we stood transfixed at Nathan’s paintings, a dream began to take shape. What if we could fill our lobby with inspiring paintings like these? When I returned to school in September I shared the dream with several staff. It truly was just a dream because our school had many needs and paintings seemed like a luxury we could never afford. Yet, for some reason, we chose to move forward on faith and over the Christmas holidays we stripped the lobby walls of their coverings and waited for the next step. 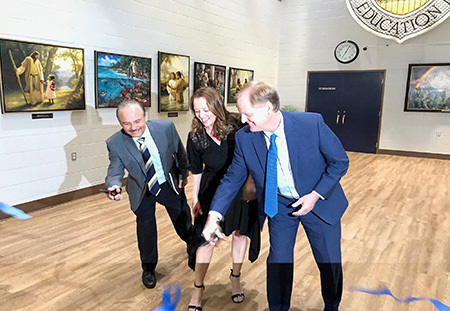 One month after stripping and repainting the lobby walls a letter from the North American Division Education Office arrived announcing that Nathan Greene, along with a generous donor, was offering all Adventist senior academy’s a free, framed painting of The Blessed Hope. We immediately RSVP’d and requested the painting! When it arrived, our vision for the lobby began to grow! After sharing the painting with the Board, two members stepped forward to help with the idea of a lobby redesign: Bob Gorbenko, who offered to re-upholster the lobby furniture and Pr. Bermudez, who offered to donate several paintings and subsequently suggested we could create a “Gallery of Jesus,” using Nathan Greene’s The Blessed Hope as a central theme in our gallery. In June 2016, we unveiled The Blessed Hope at our year-end Praise & Prayer service, sharing our vision for the Gallery of Jesus and praying that God would provide the resources to complete the project. We trusted that if this was God’s vision for His school, He would provide. Within the first week of school, in September 2016, an anonymous donor made a substantial donation to our school. This anonymous donor’s father had worked at CWAA at the time of the school fire in 1985 and had a special place in his heart for Adventist Education. The donor stated they wanted the money to be used to improve the facility.